Our school was founded on a distinctive ethos: the balanced development of mind, body, and spirit. This philosophy underpins everything we do at Aiglon, both inside and outside the classroom. Aiglon College came into being in 1949 as the living manifestation of John Corlette’s pioneering educational vision. 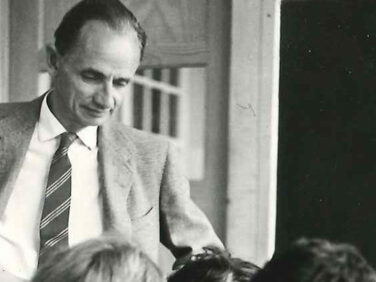 As Founder of the school and its Head Master for 23 years he established a set of values and educational priorities which remain at the very core of Aiglon’s identity. These guiding principles were articulated in the first decades of the school’s existence through a variety of statements expressed by the Founder. Since his death in 1977, succeeding generations of teachers and school leaders have sought to sustain the spirit, purpose and focus of John Corlette’s vision; the school’s growth, evolution and rapidly earned world-wide reputation bear witness to the timeless values of his vision and to the passion of those who have nurtured it and built upon it. The school’s guiding principles as they have been articulated here make them memorable and more directly relevant to our students. They are drawn from detailed research into all the guiding statements, formal and informal, that have been published over the school’s 60 year history, with input from staff, students, alumni, parents and governors. We have a responsibility to ensure that the school’s founding values and priorities continue to provide a strong and coherent foundation for the school. We must not see this as an obligation to resist change and evolution; indeed we have a duty to ensure that an Aiglon education remains relevant and appropriate for the young men and women of today, preparing them for a world in constant motion. The development of the MIND focuses on the intellect and the capacity to think, learn and reflect powerfully and purposefully. Aiglon seeks to challenge its students intellectually and academically, encouraging them to be inquisitive and motivated learners, able to reach an ever-growing understanding of the world around them through rigorous and critical thinking and the acquisition of a strong body of knowledge. This process encourages respect for a range of ideas and opinions, acknowledging that learning requires a need for open-mindedness, humility and an interest in multiple perspectives. A respectful mind focuses not just on the self, but on others and the priorities of the world around us. The world of the intellect and ideas requires recognition that we all carry responsibility. A well developed mind will reﬂect on issues of morality and rightful action, and accept that we must assume the consequences of our attitudes and actions. These responsibilities are to ourselves, to others and to our environment. A well-developed mind can engage with the world in a diversity of ways. Alongside knowledge and reasoning it shows creativity, aesthetic awareness, judgement, freedom from prejudice and true breadth of interest. A generous mind recognises the importance of service to others as an essential part of creating a harmonious and healthy society. The development of the BODY focuses on physical fitness and the maintaining of an active and healthy lifestyle. Aiglon education provides physical challenge to build strength, resilience and ﬁtness as well as to build conﬁdence and a sense of achievement as the rewards for physical effort. This process builds respect, both for oneself and for others who undertake physical challenges. Respect for one’s body includes good living habits such as healthy diet, exercise, rest, personal cleanliness and tidiness. Respect for one’s body requires making choices that reﬂect responsibility and the avoidance of habits that diminish ﬁtness and physical aptitude. The development of the body can take a diversity of forms. In addition to personal exercise regimes, physical development is promoted through team and individual sports, expeditions and performance. Furthermore, dexterity, co-ordination, sensitivity and awareness can be developed through a wide range of skills that include all the creative and performing arts. A ﬁt and able body means that physical effort can be applied in the service of others. The development of the SPIRIT focuses on the essence of ourselves and the exploration of faith, service and purpose in life. Developing the spirit represents a challenge to move beyond the intellectual and physical and to reﬂect on the deeper questions of existence. These questions may ﬁnd answers through personal faith and through the teachings of Christ and other great teachers. This challenge also invites us to be “explorers” and to take risks. The concept of spirit embraces character, the emotions and the capacity to engage fully and conﬁdently with the world in many contexts. The developed spirit demonstrates respect for the feelings of others and a recognition that relationships are built on an understanding and acceptance of a common humanity that transcends divisions of wealth, culture, religion and ethnic identity. By developing the spirit, a system of personal and collective values can be established which deﬁnes the individual and collective responsibility of the individual. This in turn shapes social awareness and the qualities of purpose, initiative and integrity that characterise effective leadership. The spirit can be nurtured in a number of ways, through action or stillness, the spoken word or silent reﬂection. In addition our lives are enriched by the diversity of cultural approaches to the deeper questions about ourselves and our world. The practical expression of the spirit – through generosity, humility, selﬂessness and compassion – is service to others, realised in many forms. I hope that all members of the Aiglon family will recognise the essence of their school in these guiding principles, and that they will be able not only to memorise, but to internalise and enact the challenges and responsibilities that they articulate.